Show your support and welcome your neighbors with a yard sign. Contact us at bridgingculturescanby@gmail.com or visit our Facebook page to get one. You can also drop by our ESL classes on Mondays and Wednesdays from 6:00 - 8:00 at Baker Prairie and we usually have some available. We suggest a donation of $10 per sign to pay for the cost to make them. ​You can also download the image below and print your own sign at any print shop. 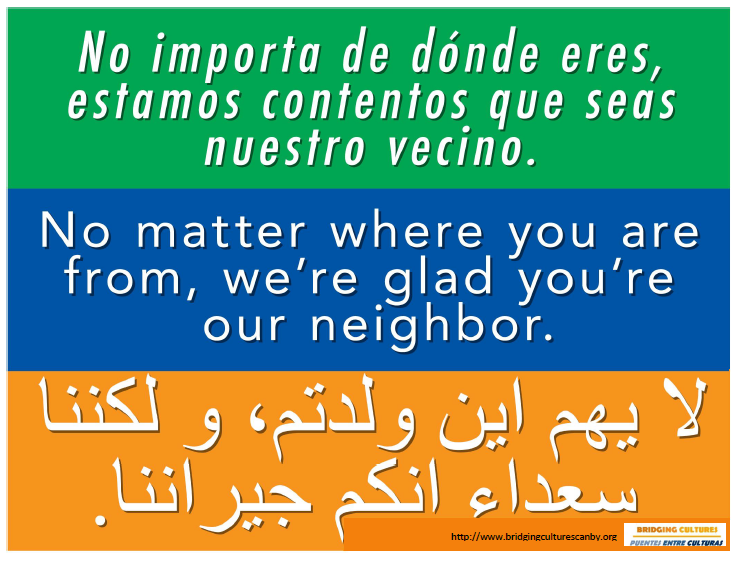 A big thank you to the Welcome your neighbors campaign based in Harrisonburg, VA, for creating the sign image! You can learn more at www.welcomeyourneighbors.org.